6:45 AM. Two angry birds scream at each other. This will be my alarm clock for the next nine mornings. On my run, it begins to rain and then thunderstorm. I turn up my headphones and sing “Born This Way” at the top of my lungs to prevent hearing thunder claps. 9-10 AM: Check in old friends Kassie, Beth, Jina. Facebook each check-in as I go. 10: Campus tour…I remember everything from the list T gave me except pointing out to new students the “safety room” in PDR. What’s a “safety room”? Program highlights: Dennis Lehane, Jacki Woodson, Lee Hope…Student Readings. GGrad lecture: Kate Schmidt- Allusion in poetry…The negatives…Getting a handle on allusions. What is an allusion? It takes the reader outside the text, forces the reader to leave the familiar, brings in material that has nothing to do with the poem. “The first task of poems that I want to publish is that they are open to the reader.” – anon. Allusions can make it hard for the reader–that’s the negative. Sometimes writers sneak in agenda. Sometimes things are better dealt with indirectly. You did a great job at residency, Hannah. I can't wait to read tomorrow's post. No pressure but... MORE MORE! This is really great, Hannah. Miss you! The clipboard holding picture is clutch!!! Love the line about falling in love with the writing of others in order to be happy for their success and not feel it blocks our own. Indeed, that positive feeling should lead to positive results like improvement in our own writing. The negative feeling of envy can only spiral downward toward undesirable negative results. 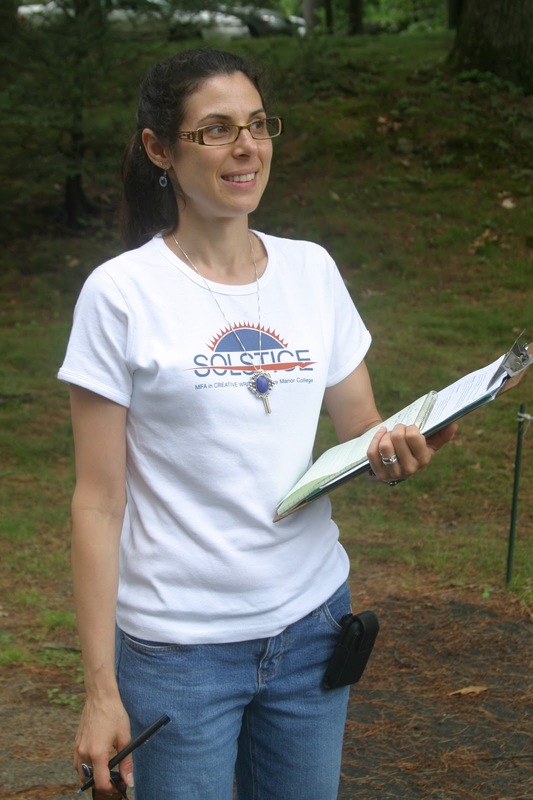 BTW, you do look official in your t-shirt with your clipboard and pen. What a splendid experience for you! I must admit to loving your writing and feeling thrilled for your success and the wonderful opportunities it has brought you. Yay! I've loved reading all of these, Hannah, but I'm posting on this one, because I love this photo of you with the clipboard. So wonderful.